The acquisition of a 2.8 parcel adjacent to the operational dam at Eagle Lake and extending southward to include the old earth dam, represents one of White Oak’s earliest achievements. Plans were in place in the early 1980s to drain the lake and build on it, after the dam fell into disrepair. Through a major fund raising effort and the support of the public, this was averted, the dam repaired, and Eagle Lake remains as a destination for fishing, swimming, canoeing, ice skating and hockey. The dam is operated by the Holden DPW, but the dam structure is co-owned by three entities, White Oak owning 40% (the upstream portion of the dam) and two private entities owning the remaining 60%. The property and the dam are publicly accessible from Main Street. Eagle Lake began when the Asnebumskit brook, which flows down from Paxton, was dammed for a water mill close to the site of the now defunct Jefferson Mill. From a deed of 1798 we know that a mill and dam were in place then. Caleb Kendall built a new saw and grist mill in 1806, and later raised the water level, but in a map of 1832 the lake seems to have been much smaller than now, with only a small arm extending behind Kendall Road. Samuel Clark purchased Kendall’s mill in 1829 and built in its place a small textile mill. The mill grew under Martin Van Buren Jefferson, who gave his name to the area. Like others, the company declined and eventually liquidated in 1939. Despite this industrial background the Lake was enjoyed by Holden inhabitants and by summer visitors who came to the several hotels which were built in the 1880s after the railways came to Holden. The picture card below is from 1910. 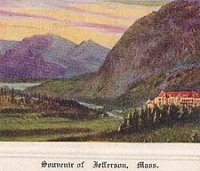 The card below shows a view looking to Stump Pond across Causeway Street in 1908. This corner of Eagle Lake, at the far end of Causeway Street, is now completely overgrown. Two towers on the skyline near the center are the turrets of Mount Pleasant House, now the site of the Holden Country Club. The increasing demands for water from the brook for the Pine Hill and Kendall reservoirs reduced the flow into Eagle Lake, but since water power was no longer needed at the mill, the water level was unaffected, though silt and mud accumulated. Most of the lake was only a reservoir. The real mill pond was the small space south of the dam, enclosed by an earthen dam, remnants of which can still be seen. A channel was cut through this in 1975, against regulations, to provide a runway for a seaplane, which lowered the water level by two feet. To make matters worse, the mill dam itself had deteriorated and leaked badly. As the level fell, the clear water was overrun by dense weed growth. The picture below is from an old newspaper photograph and shows the earth dam as it was in 1961, with a small tree growing on it. The town beach is on the left. The earth dam as it was in 1961, with a small tree growing on it. 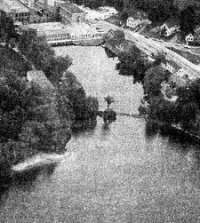 A lengthy negotiation followed, and while Army and State engineers warned that the dam was unsafe, Jefferson mill changed hands several times. In the end White Oak led a fundraising drive for $50,000, to match a promised $150,000 grant from the State to repair the dam and dredge the lake. Though the money was raised, the State was in the middle of a financial crisis and could not provide sufficient funds for the project. 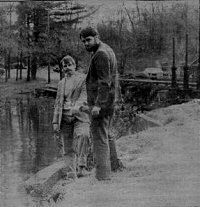 The picture below from the local paper shows two White Oak board members inspecting the falling water in the mill pond. Though with the moneys we raised the dam was eventually repaired in 1993, the lake could not be cleaned without the grant that had been promised. White Oak now owns the dam and the mill pool. We hoped that though the water level could not rise to where it was before the earth dam was breached, returning it closer to the original level would be sufficient to check weed growth. This hope proved optimistic. Subsequent surveys commissioned by White Oak showed the weed growth was not only unaffected, but flourishing. In 2001 the town received a $5,000 grant from the State, with a matching grant from White Oak, to pay for the services of an environmental expert to advise on the best way of dealing with the problem. A winter draw down was recommended, lowering the water level of the lake so that plant roots would be killed by frost. The permits were obtained, but the town engineers were not able to do this before the first frosts, and so we will have to wait until 2004 to see if this solution works. There was once a float-by geocache on the lake.